Suddenly I was faced with a worrying problem as I could not get my kids to eat any vegetables. I felt challenged as a parent. 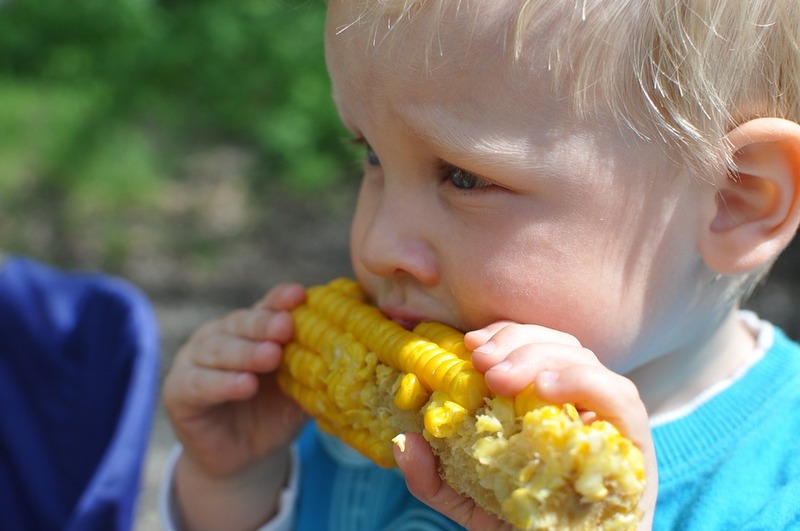 Gone were the days when eating carrots, onions, broccoli, peas, green beans and sweet corn were the norm. Suddenly it was a case of a nose being turned up at all vegetables served up. I understood that many youngsters resist t eating certain vegetables, but suddenly they were all on the black-list! It was a problem I was determined to overcome and I took up the challenge. I decided that in order to put vegetables back on the menu I needed to be creative and a little bit cunning. Using trial and error I have discovered quite a few imaginative ways to get my youngster to happily eat more vegetables. In fact the whole family are benefiting from my research and experimentation! With luck your youngsters (and all of your family) will embrace or enjoy some if not all, of my recommendations! Dietitians advise that children need to eat every three to four hours, comprising three meals, two snacks, and lots of fluid. By adopting this strategy your child’s diet will be much more balanced and there will be less chance they will become irritable, since hunger pangs won’t be plaguing them. Secondly, cut back on junk food. By having fewer junk foods available your children will be encouraged to eat more fruit, vegetables, whole grains, and dairy products and lean meat. Our ancestors did not have the temptation of junk fast food snacks and were healthier as a consequence. After a while your children will forget about junk food and enjoy, instead, fresh fruit, raisins and nuts, cheese, eggs and milk when you offer them. Occasionally use soy milk as a healthy substitute in mashed potatoes, cakes and tarts, and homemade sauces. Ensure your youngsters regularly eat fibre, ideally 6 grammes daily. Breakfast, in the form of high fibre cereals, or fruit, is the easiest opportunity to introduce this on a daily basis. Choose multi-grain waffles or buckwheat pancakes, then spoon on Yogurt rich in high fibre fruit, sliced banana or chunky peanut butter spread. Breakfast oat brownies will also prove very popular. Try starting with two or three days in advance, making sure it is balanced with whole, rice, or pasta, a fruit or a vegetable; and a protein source like lean meat and cheese. Soup is a good starter and is a very good way of introducing vegetables and protein into the diet, even adding multi grain croutons into their bowl. Combined with healthy multi-grain bread it delivers valuable daily nutrients. A big batch of soup can be made and then frozen into serving portions. Resist becoming an a-la-carte restaurant. Don’t fall into the trap of cooking something different for each member of the family, or one for the adults and one for the children. This can be exhausting. The secret I have learnt is to cook just one meal, encouraging the children to cherry pick from what is available on the table. Ensure the fare is a balance of protein (lean meat, fish and cheese), vegetables such as carrot, broccoli, peas and beans, carbohydrates such as whole grain rice or pasta, potatoes. Over time you will find that your children mimic your eating style and will even take a portion of everything on offer. Never become a “food enforcer” or this will create tension and resistance to what you are directing them to eat. Be patient and over time they will grow to sample most things. We all have our favourites and so as long as it is balance over the week they will be eating healthily. Refer to fit looking role models to promote your strategy and advise your children that they got to look that good by eating a nutritionally balanced diet, including vegetable like peas, beans and broccoli, multi grain bread and waffles. Liven up food with tasty sauces, dressings and dips. As adults we often liven up dull or low level tasting food, in particular vegetables, with some sauce, or dunking them into a flavour some dip, like salsa, sour cream and chive, garlic and onion, peanut butter, jam, honey and yogurt. We apply dressings to salad, and flavour up meat with marinades. Use this approach too for the children by offering them healthy sauces and dips of their choice. This will definitely encourage them to eat a greater variety of vegetables and whole grain bread and pasta. You can even add a SMALL amount of healthy, brown, unbleached sugar to sweeten up certain fruit and vegetables to make them more palatable. Children love cooking and regard it as a sort of alchemy experience. In the cooking process you turn liquid cake mixes into delicious solid tasty bites – how magical is that! Get your youngsters involved in the preparation and cooking process and they will certainly be more enthusiastic about eating the product of their joint effort. Encourage them to accompany you to the store and consult them on the choice of ingredients you will use to prepare the dishes they will be helping you with. Jobs that older children can assist with include chopping vegetables, making salads and adding dressings, mixing and blending pancake and cake mixes. You will be surprised how much more interested they are in eating what they have helped you cook, so do try it. Continue to allow some treats. Occasionally giving them some ‘less healthy food’ prevents these foods/treats from becoming ‘forbidden fruit’, and causing cravings. We recommend you buy only healthy cereals such as fruit with bran flakes and nuts and raisin bran. Do let your youngsters indulge in a sugar coated cereal or cereal bar once a week or every fortnight. Allow them to have pizza or burgers when out and about or when visiting relatives or friends. The occasional treat will not do them any harm, and removes the notion of deprivation of sugary treats. With younger children a fun element can be the creation of animal shaped biscuits, smiley faces on buckwheat pancakes, or making up amusing names for certain vegetables. I call cauliflower florets ‘silver birches’ or ‘polar bears’. Use any name that fits the shape. Use biscuit cutters like stars, triangles, and hearts. Use alphabet letters to make interesting letter shapes, or even words in your pastries, pancakes, toast and wholegrain buns. Enthuse your children by growing your own vegetable patch. Sow seeds for onions, carrot, broccoli, peas, courgettes and cauliflower. In your small herb garden sow thyme, parsley, and rosemary for example.